Pardon my absence for the past week or so. I haven't given up on the blog, it's just that it's now beginning to be a busy time of year for me in making preparations for the coming school year. I do plan to return to a more regular blogging schedule--even if only a little each day--just bear with me. It's true that time flies, but it seems to be more the case for a teacher who has a couple months off during the summer. Actually, as I've gotten older it seems that the months and years go by much faster than in the idyllic seeming days of my youth when time seemed not to move at all. Thanks to unceasing rain, my usual summer trip to the beach didn't pan out this year; however, I did have a nice visit to my hometown. Summer this year gave me time to catch up on some reading--the Pope's book, Jesus of Nazareth, which I am still digesting, as well as the documents that have been in the news. The interest in the motu proprio caused me to seek out the Latin Mass community here in Austin and to discover the experience of the Tridentine Mass for the first time. I feel compelled to look deeper into it; undoubtedly my appreciation for the Novus Ordo, especially when it is done with beauty and reverence, was heightened. You may notice a slight change to my blogroll--I've added Deacon Tom Stonecipher, a newly ordained deacon serving near Atlanta, Georgia. Deacon Tom, like myself, is a convert from evangelicalism. I plan in the near future to add even more blogs of interest. Please visit Deacon Tom's blog and leave a comment! Looking several months in advance, my long range plan for deacondanwright.org is to eventually revamp the look (provided that I get a hold on CSS). However, don't expect too many changes before next year. I would like to include more of my own photos on the blog, so be on the lookout. I'll still be doing my regular spiritual reflections and occasional news blogging, but as the school year begins don't be surprised to see more that has to do with special education and disability advocacy. Meanwhile, I have one last out of town trip coming up, which I'll be sharing with you soon. I discovered this evening that stories on Francis Beckwith's conversion are still showing up. Although this one is a couple weeks old, I'd like to share it with you. I especially find Beckwith's view on the distinction between Protestants and Catholics to be most interesting. What could be more personal than a man re-examining his convictions, sharing them with his family and priest and rejoining something he'd left behind? And yet Beckwith's decision was by no means private. Because of his role as president of the Evangelical Theological Society and because of his association with a Baptist university, Beckwith's reconversion, or reversion, to Catholicism drew national media attention and elicited the ire of his evangelical colleagues. "You are embracing serious theological error," warned one. I talked by phone with Beckwith, 46, during a rare break from his travel and writing (he's wrapping up a book on politics and religion due out next year). I first wanted to know what led him away from Catholicism. And how his family reacted. Beckwith said he was coming of age in 1970s Las Vegas when his parents' friend left "Good News for Modern Man," a modern English version of the New Testament, at his home. The 12-year-old Beckwith devoured it, then accompanied the man to a Jesus People church, where he heard from various Christian traditions — a different denomination every week. As a teen, he frequented evangelical bookstores and attended nondenominational churches such as Calvary Chapel, searching, he said, for something a little more sophisticated than the morality lessons he read in his Catholic high school. Now this is where you expect the parents to hit the roof. Instead, they let him follow his theological curiosity. "I guess in their mind they thought, 'he's not doing drugs. OK, it's Protestant, but he hasn't become a Moonie or anything,' " Beckwith said laughing. "My parents were always very open, and I never felt that they interfered with what I was doing." And though he became more comfortable with the reformed theologies of Luther and Calvin, Beckwith never felt hostility toward Catholicism. "I think it was because I knew too many serious Catholics that I thought were also serious Christians," he said. "I thought the Catholic Church was wrong about some things, but I didn't take the posture of some evangelicals that Catholicism was hopelessly corrupt." Of course, attitudes among evangelical Christians have certainly changed in recent years, as have the attitudes of Catholics. Look at political alliances that yoke the two on issues such as abortion and stem cell research. Look at evangelical colleges where professors are assigning students to read Aquinas and Augustine. Baylor University has some 80 Catholic faculty members. Beckwith will hardly be an alienated minority on campus this fall. Most of the comments posted on his blog were supportive of his decision to return to Catholicism. Perhaps his biggest hurdle was how to handle his position with the Evangelical Theological Society, a national association of Christian scholars. After word of his reversion leaked, Beckwith decided to resign. In some ways, it must be harder to return to the church you've left. You must ask yourself, weren't my reasons for leaving valid in the first place? Am I certain this is the right move? Will I lose my colleagues' respect? Of the scholar who accused him of embracing theological error, Beckwith said, "The idea that somebody could actually move away from this point of view and be fully informed is unfathomable in his mind, so it must be that I'm either wicked or stupid." It's not as though Beckwith had railed against the Vatican or demonized the pope as the Antichrist. But he did make a decision that Rome had it at least partially wrong, that his soul was better served in a Baptist church. And yet, still, that theological hunger gnawed at him. Beckwith had been reading evangelical scholars who questioned the great reformers. Then a conversation with a Catholic convert spurred him to review the writings of the early church fathers for a fresh look on the practices of the church he struggled with. Finally, he said, he realized a distinction between Protestant and Catholic worldviews. "Protestants are concerned about how to get you to heaven," he said. "Catholics are more concerned about getting heaven into you." Two former US presidents and five first ladies have paid a final tribute to Lady Bird Johnson, remembered for her uncanny ability to calm her restless husband, former President Lyndon Johnson. Speaking at her funeral in Texas, former Johnson White House aide Bill Moyers said her shy demeanour and grace cloaked a formidable influence on the colourful president at a time of great tumult and uncertainty. "He needed her," he said. "Lady Bird truly loved the man she often found impossible. "She often found herself in the path of his Vesuvius eruptions." The widow of the former leader, nee Claudia Alta Taylor, died on Thursday at the age of 94. She was known by the nickname Lady Bird since childhood. Her husband, who was elected vice-president in 1960, took over the White House when President John F Kennedy was assassinated in Dallas in 1963. Former presidents Bill Clinton and Jimmy Carter were among those who attended her funeral in Austin. 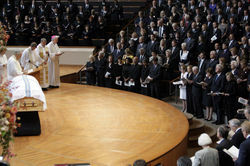 The Photograph above, which was included with the ABC News (Australia) story that I quoted, reveals that Bishop Emeritus John McCarthy of the Diocese of Austin was one of the presiding clergy at Lady Bird Johnson's funeral. AUSTIN — The words of the Litany of the Saints — a prayer that calls on holy people from the Old and New Testaments of the Bible — ushered Lady Bird Johnson from this world, according to the priest who was with her and her family as she died. "Abraham, our father in faith," began the prayer by Father Bob Scott, who was called by Johnson's daughter, Luci, as the former first lady lay in a coma at her home. He continued through the roster: "David, leader of God's people, Saint John the Baptist, Saint Stephen." As each name was cited, the group of about a dozen family members and close friends responded, "Pray for Claudia," Lady Bird's given name. Scott, a Catholic priest, was called by Luci, who is a Catholic, even though Johnson was Episcopalian. He knew Johnson, and has a relationship with her family, because her grandchildren attended the school associated with St. Austin's church. Scott's affiliated with the church, which is near the University of Texas. The priest did not perform formal last rites but simply prayed with the family, after being called when it appeared Johnson was going to die. "I said, 'Let's say some prayers and give her a welcome into heaven, from all the saints in heaven," Scott said today. "I finished the Litany of the Saints, believe it or not, and the nurse said, 'She's passed' — at that very moment when I finished the Litany of the Saints." Scott then started another "beautiful prayer which says, 'Go forth, Christian soul, from this world, in the name of God, the Almighty Father who created you, in the name of Jesus Christ, son of the living God who suffered for you , in the name of the Holy Spirit may you see your Redeemer face-to-face and enjoy the vision of God forever." For a number of years I have known Fr. Bob Scott, a Paulist, primarily because of my own children having attended the school at St. Austin's. However I also knew him from an earlier association I had as a volunteer at the University Catholic Center, which is near St. Austin's. When my mother died in 2000 it was Fr. Scott who said the daily Mass for her at the Catholic Center. It was also a former St. Austin's pastor, Fr. Jim McCabe, CSP, who originally supported and encouraged my entrance into diaconal formation. In many ways I remain grateful to the ministry of the Paulists. Father Scott, in my opinion, is a priest who is dedicated to progressive ecumenical, ecclesial, and social views. In this he is not unlike the majority of his fellow Paulists. I thought it seemed somehow right that a clergyman like Fr. Scott would have been present at the time of the former first Lady's death, though I know that it was his friendship with the Johnson family that made it possible. Since first reading the news of Lady Bird Johnson's death yesterday afternoon, I was saddened in many ways. Her name was practically a household word as I was growing up. Anyone who knows Texas also knows that Lady Bird Johnson stood for the many good things that it means to be both a Texan and an American. May she rest in peace. As the rain clouds moved out and the summer heat began to rise, I decided that a day trip might be in order. One of the many nice things about living in Austin is that it's centrally located. Texas is 267,000 square miles of land, so getting from one place to another typically translates into a long drive. However, just 79 miles south of Austin is the city of San Antonio. Feeling a little like getting out of the house I made it a family day trip yesterday, and although I took a couple hundred photos the ones I'd like to share with you are of the San Antonio missions. While there are five missions in San Antonio, time restraints prevented me from visiting all of them. 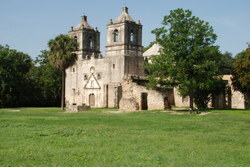 One of the most beautiful is Mission Concepción, which reportedly looks very much the way it did when it was constructed almost 300 years ago. Being there felt a little like stepping back in time. Twelve years ago, when my oldest son was still an infant, my wife and I attended a Saturday evening Mass at Mission Espada, which at the time was still an active parish. I remember the Mass being in English, which I thought to be interesting for a parish in a Spanish-speaking community. On this visit I did see some signs that Mission Espada is still under the direction of the Franciscans. 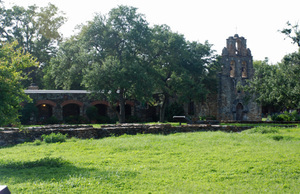 Along the way to Mission Espada I passed Mission San Juan and took a quick photo. By this time the gates at Mission San José were closed, so unfortunately I was not able to photograph it. Due to the time of day none of the missions I visited were open for interior viewing, with the exception of the Alamo--actually my first stop downtown upon arrival in San Antonio. However, interior photography is not allowed there. Still I managed to get a number of good exterior shots. Finally, I made a visit to San Antonio's San Fernando Cathedral--itself not a mission--where I was able to take a number of very good interior photos. The most striking were of the Cathedral's old main altarpiece, which is now used as a chapel because the actual altar has been moved to the center of the Cathedral. While at the Cathedral I discovered that the remains of William B. Travis, David Crockett, and James Bowie are all interred there. My own ancestors were in Texas in the days of the Battle of the Alamo. At that time in order to live in Texas immigrants were required to convert. My early Texas ancestors were both residents of Mexico and Catholic, at least officially. There's one thing certain about visiting San Antonio this time of year: it's hot. I've heard it said that not even the devil himself will go to San Antonio in the summer, but you've got to wonder whether it's the heat or the wonderful Catholic history of the place that really deters him. For several weeks I've wondered if the rain would ever stop. Finally I decided that it wouldn't and, determined to get out of town for a few days, I left Austin for a brief getaway in spite of being waterlogged. About once a year I make it a point to return to the area where I grew up: the far NE corner of Texas. This year I decided to make it something of a spiritual retreat--or perhaps a pilgrimage--in that I wanted to visit places in my life that have been decisive in my formation as both a human being and a Christian. I'm sure that the loblolly pines and expansive lake had everything to do with it. I remember the tall trees being everywhere when I grew up, and at least they kept me looking heavenward. Certainly, there was something heavenly about the natural beauty of it all, and thus my title for today's post. Last Friday I decided to visit the Church where I was married. I'm including an interior photo of it. My visit to the church was the day before the release of the Motu Proprio Summorum Pontificum, and while there I couldn't help but think that this church was made for the old Mass, and in actuality it was. 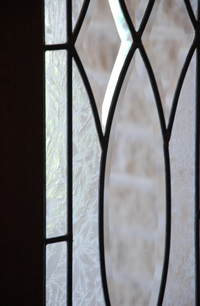 I'm also including a photo that I recently took of the interior of the church where I currently serve in Austin. While my parish has its beauty, the stark contrast between the two should explain to anyone with curiosity why I tend toward things a little more traditional. I don't get a lot of tradition on my plate as a rule, but it's always possible to let it be an attitude of heart. I find that it does good to revisit places that I haven't been in years. It helps me to place my current life in a better context of appreciation. Change seems to be a constant, but God renews our hearts daily. Through it all I offer a prayer of thanksgiving. Through time God's presence has permeated my life in rich and varied experiences. In all I have learned more than anything to appreciate the goodness that being Catholic has brought. Truly, God is great! As I reflected on today’s gospel, the story of Thomas’ doubt reminded me of something in the Sunday gospel that I chose to save for a later time. I wasn’t certain when I would actually get to it. However, when I saw today’s reading I realized a connection that I hadn’t previously considered. Actually, today’s gospel and the portion of Sunday’s that I am considering are quite dissimilar. It is what brings them together that interests me. It arises from the Sunday narrative that while they were journeying to Jerusalem someone spoke up and said,” Lord, I will follow you wherever you go.” Jesus replied "Foxes have holes, and birds of the air have nests; but the Son of man has nowhere to lay his head." However, it is the passage from Sunday’s readings that has stood out in my memory as a more enigmatic proclamation. At first, as a young reader, I wasn’t sure what to make of it although in more recent years I have interpreted the Lord’s words to mean “Do you realize what you are saying? What lies ahead will not be easy.” It is an interpretation that fits well with the “don’t look back” theme of Sunday’s message. The true blessing is to believe without the evidence of certitude. Jesus saw the time coming when such faith would be necessary, and in this sense it is true that faith is what saves us. It is by faith, and only by faith, that we behold Jesus. Yet to the believing heart his presence permeates our world. Through the faith of uncertainty the reality of God is able to break in to our concrete world, thus we are able to participate in the sacramental economy of salvation. Although the eyes of faith behold far greater realities than the surest of realities available to the senses, Jesus did not tell us that we would not have visible signs. The created and seen order does indeed have commerce with the unseen. Clearly the Lord gives Thomas the sign of certainty, yet Thomas held the divinity of Christ in his heart already and was thus able to proclaim it upon touching the Lord. Though a doubter, Thomas had tremendous faith based on what was not at all clear to everyone; namely, that Jesus is both Lord and God. Faith leads us forward into the open-ended realm of possibility, and in its correlate of uncertainty it also calls for courage to move ahead into the unseen and intangible world of all our tomorrows. The promise that it holds is in the expectation of its fulfillment; that is, it is in the hope that looks toward the day when we shall see him face to face as he is.